It was a simple question to Gary Johnson in a 2012 interview, while running for President as the Libertarian candidate: How do you stop the deficits and out of control spending? A: Well, cutting $1.675 trillion from the federal government. You got to start out by talking about (cutting) Medicare and Medicaid by 43 percent. They could block grant the states, 50 laboratories of innovation. Give it to the states to deliver health care to the poor and those over 65 and do away with the strings. Do away with that regulations; let states handle it. There would be best practices emerge. Other states would emulate the best practices. They’re be failure. States would avoid the failure. Johnson also wants to eliminate the Federal Income Tax, which would require huge program cuts in the federal budget to pay for it. His revenue solution would be a national 23% sales tax, plus virtual elimination of the earned Medicare benefit (now paid for by workers with a payroll tax). Can you believe that any governor would not remove benefits or lower compensation to doctors for procedures, just to reduce their state budgets? About 25% of all doctors now refuse to accept Medicare patients, because payments for procedures are so low. Johnson’s plan would eliminate these payments and instead expect doctors to just accept a monthly stipend. Will nearly all doctors then refuse to treat seniors? Johnson also wants to exempt businesses from paying FICA taxes, currently their share of Social Security. A: Yes, if it’s possible. I would do the same for [President Bush’s Medicare] prescription [drug subsidies]. Two parties can take responsibility for where we’re at right now. The Medicare D prescription drug benefit plan that Johnson wants to eliminate, already requires seniors (who pay a monthly premium) to put out more than $4,500 a year per person, before catastrophic co-pay kicks into effect. With many commonly-prescribed drugs now costing more than $3,500 a year, some seniors must skip drugs for food and are risking their lives, just to save the government money. Current misery is not enough, Johnson wants more in his obsession for a “balanced” budget. A: I would cut Social Security by raising the retirement age (to 72) and have common sense means testing that’s fair. I would scrap the entire federal tax system and replace it with the FairTax–a one-time consumption tax, with no more Medicare and unemployment payroll deductions–so we’d replace all federal taxes, abolishing the IRS. A: I do–but the problem is that passing balanced budgets for future years is what we do and it takes away the immediate problem and kicks it down the road. A: My plans don’t include doing anything when it comes to student loans. The reason for the higher cost in higher education rests with the fact that there are those student loans available. Because those loans are guaranteed, kids are graduating from college, literally strapped with [the equivalent of] a home mortgage. I’m a believer in free markets. 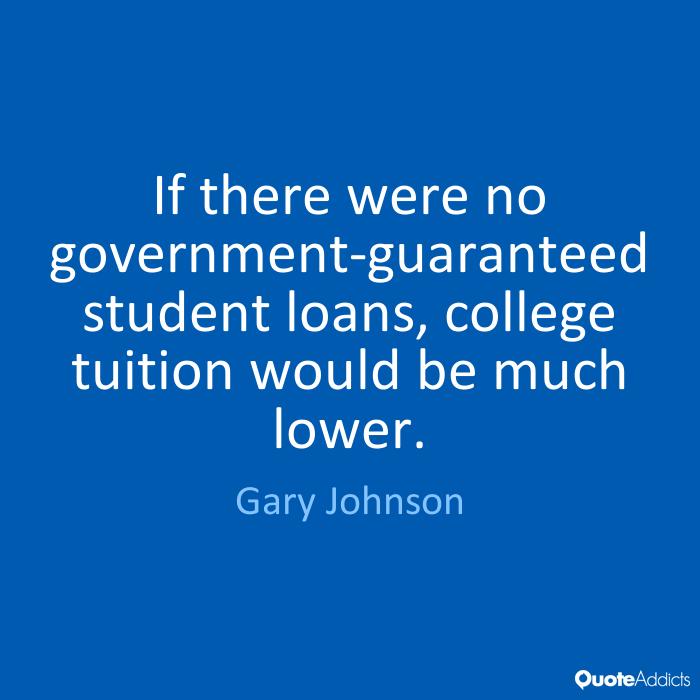 I suggest that if student loans did not exist…tuition would be a lot lower because colleges and universities want to deliver their product, and if there weren’t as many kids going to school because it costs too much, they would find ways to lower their price. They haven’t met that necessity; they don’t see that as a necessity because all students can get student loans. Hence the high cost of college education, where you see the costs of other goods and services dropping. Johnson’s idol, Ayn Rand, would be proud. 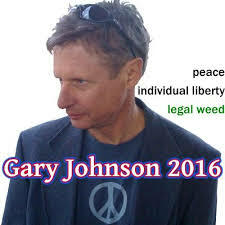 Related: Romney says he may vote for Gary! xraydavid, you are absolutely right. Even if Medicare was cut, which it will not be, the upside is that everyone keeps their whole paychecks tax-free. The rich pay too much as it is.